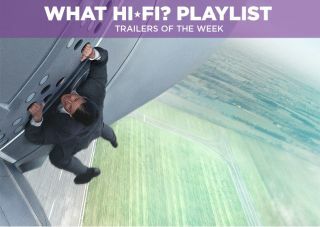 Trailers of the Week: Spectre, Mission Impossible and more | What Hi-Fi? First up, the one we've all been waiting for: the first Spectre trailer. And it's a good 'un, managing to successfully get our pulses racing at the thought of a new Bond, without giving very much away at all. In the Mission: Impossible series Tom Cruise has clung on to the side of speeding trains, climbed one of the tallest buildings in the world (he really did), and in Rogue Nation he decides to go even bigger - hanging on the outside of a plane during take-off. FOR REAL. That is monumentally crazy and we'd expect nothing less from Cruise. Elsewhere, Rogue Nation sees the IMF on the verge of being disbanded but when another threat appears - the rogue nation of the title, essentially IMF but bad - Hunt (Cruise) and co. spring into action with the help of a mysterious character played by Rebecca Ferguson. But who cares about that, DID YOU SEE THAT BIT WITH THE PLANE? Fans of HBO show Entourage rejoice, they're back and as this trailer shows they're bringing a ridiculous number of cameos with them. The more important question, though, is can this film rekindle the spark that made the show far more interesting in its earlier seasons? It's something of a Game of Thrones reunion (well, even if they never met) as Kit Harrington (Jon Snow) and Elyes Gabel (Rakharo) go up against each other in Spooks: The Greater Good. That seems to be question everyone's asking in this trailer for Slow West. The cast looks great (Michael Fassbender, Ben Mendelsonn, Rory McCann) and we're liking the vibe of this trailer. A possible surprise indie hit when it's released later this year?